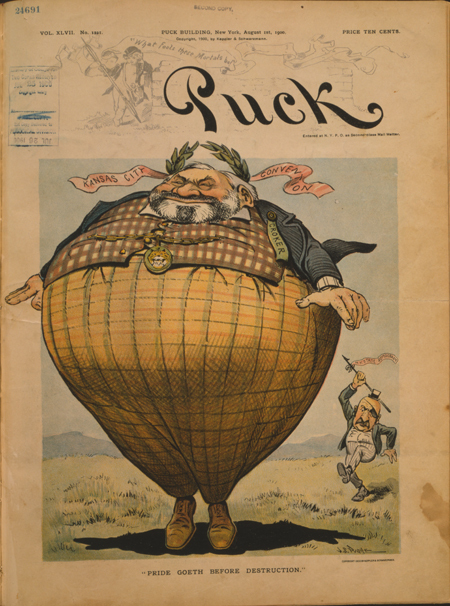 Political cartoons, many of which contain both an image and text, are great primary sources to use with students to help them recognize and understand symbolism, perspective, and bias as well as put people, events, issues, and ideas into historical context. The analysis of political cartoons, like other primary source images, Common Core English Language Arts Standards (CCSS). They are also particularly helpful in meeting grade 6-12 Literacy in History/Social Studies Reading Standards 1, 2, 4, 7, and 9. The Library of Congress has a few political cartoon collections with many images available online (American Cartoon Prints, British Cartoon Prints, Swann Collection of Caricature and Cartoon as well as numerous online exhibitions devoted to cartoons (Hold control/command + F and type cartoon to find each instance). You will also find thousands of cartoons in the Prints & Photographs collection of Miscellaneous Items in High Demand, including this wonderful set from the political magazine Puck (1871-1918), and by searching the digitized historical newspapers in Chronicling America. And don’t miss these PSN-featured political cartoons. To help students analyze political cartoons, you can have them use the Library’s primary source analysis tool and the list of guiding questions provided below, which were adapted from this list. You might also want to check out this political cartoon primary source set (includes a teacher guide) as well as these resources for learning how to read cartoons. What do you notice first? Describe what else you see. Describe what is happening in the cartoon. What people and objects are shown? How are they arranged? How do they relate to one another? What is the physical setting? Is place important? Is the cartoon realistic, exaggerated, or abstract? What do you see that looks different from another kind of illustration, photograph, or other work of art? Do you recognize any symbols? Describe any that you see. Are any words used? Are there few words or a lot of words? Do any of the words help explain the symbols? Are there details that suggest the time period this cartoon relates to? Is the creation date listed in the bibliographic record? If the creation date is listed, was this cartoon created at or around the same time period the cartoon relates to? What tools might have been used to create this cartoon? Why do you think the creator chose to include the people and objects shown? What might have been left out of the frame? Are the words used literal or figurative? How do you know? Why do you think the creator chose these particular words? Do you think anything was purposefully left unsaid? How are symbols used and what do you think they mean? What perspective or bias does this cartoon show? What evidence supports your conclusion? Why do you think this cartoon was made? What might have been the creator’s purpose? What evidence supports your theory? Who do you think was the audience for this cartoon? What do you think the creator might have wanted the audience to think or feel? Does the arrangement or presentation of objects and text affect how the audience might think or feel? How? What do you feel when looking at this cartoon? What was happening during the time period this cartoon represents? If someone made this cartoon today, what would be different/the same? What did you learn from examining this cartoon? Does any new information you learned contradict or support your prior knowledge about the topic of this cartoon? QUESTION: What didn’t you learn that you would like to know about? What questions does this political cartoon raise? What do you wonder about . . . Please feel free to download and distribute the Political Cartoon Analysis Guiding Questions document and the primary source analysis tool (but please keep the formats, including logos, intact).